For once, I did not foot the bill (although I tried hard) as I was invited by Mr. Sakurai, an old friend of mine and the sire of a favourite student of mine. Therefore I must admit I do not have a clue to how much the bill amounted to, although the place is fairly reasonable. Shibata was opened 20 years ago and has already gone through a total renewal in 2003. It is extremely popular and busy. Reservations are a must on week-ends! Sazae/Turbo shells in its shell and inides in a small plate. Maguro Chutoro/Tuna Fatty part (right). Awabi/Abalone (small on left). 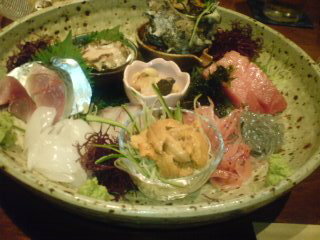 Bottom right, raw Sakuraebi/Sakura Shrimps from Yui Cho and Shirasu/Sardine Whiting from Mochimune. Centre, Uni/Sea Urchin in a cup. Centre left, Shime saba/pickled Mackerel. Bottom left, Aori Ika/Aori Squid and Suzuki/Seabass.